As you may well be aware, more and more rumours and underground mumblings are starting to appear around the topic of a revised Nintendo Switch; last October, The Wall Street Journal suggested we'd have a new model by the end of 2019, and just last week, Japanese publication Nikkei also reported that a smaller, more affordable console is on the way. The rumoured system is expected to be a 'Switch Mini' of sorts, acting as a "miniaturised" version of the console which will focus on the Switch's portable aspect, bringing the suggested retail price down in the process. While the specifics of the new machine haven't been shared, the report suggests that Nintendo will "cut features" to achieve the price cut, suggesting that we may see a Switch without detachable Joy-Con, or perhaps even without a dock. "We have nothing to announce on this topic." Is this because Nintendo literally has nothing to announce about a Switch revision, or is it just a typical attempt to shrug off any rumours until the company is ready to reveal its plans? We won't know until further down the line. Until then, though, why not let us know what you think about the situation in the comments? Do you think a Switch Mini is on the way? Do you want one? Tell us below. Obviously, if they say, "we gonna announce soon" watch the current SKU sale dive into oblivion. I for myself do not need or want a Switch Mini. I only want a Switch Pro or Switch Deluxe etc. BUT in about 2 years I do not want it now. Announce nothing to announce. Two negatives make a positive? My maths computes that when Nintendo is being secretive they clamp down. Something is up. Hoping it's a Switch Pro. "Nothing to announce" is not the same as "we're not doing it". If they weren't working on a new model they'd likely say that, so if anything this is a confirmation. Nothing to announce because there is nothing to announce. I want bigger, not smaller. Unless smaller has an OLED, 1080p screen with better battery life. But I can’t see that costing less than the current model. @BulkSlash It's Corp. speak for covering their behinds, in order to not beholden to that statement, if they decide to do it within the future. So it's not a confirmation either. It's rather a "keeping all ways open." Switch Mini is looks like a Giant PSP. If they deny this, next time they say they have nothing to announce, idiots will see this as a confirmation. So Nintendo is doing the right thing. Back in June 2012,Nikkei reported Nintendo were set to announce a larger 3DS the next day. Nintendo issued a "strongly-worded statement saying Nikkei's story isn't based on information released by Nintendo and is full of mistakes". The next day came and went, no larger 3DS but then 2 weeks later they announced the 3DS XL. I reckon the Switch Mini is coming soon and will be announced in the next Direct. Do they have anything to announce, like new games, at all? Nintendo are usually tight-lipped on anything they're working on, not just hardware. They're always working on new hardware, but like Lemmy_the_Koopa says, they'll announce something when the timing is right. I can personally see them doing both a Switch Mini as a budget option, and a Switch Pro as a premium option, much like the 2DS and the New 3DS XL before it. People will happily pay for a premium option that boasts better features, parents will happily buy the cheapest option to please their kids. 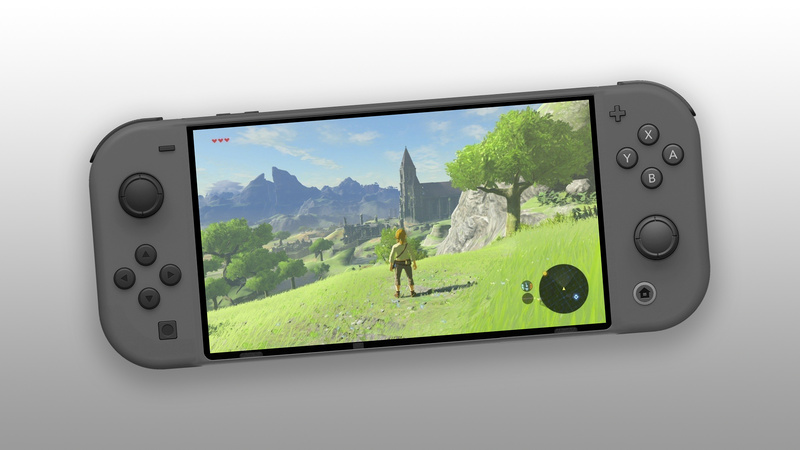 A Switch Pro would be fairly straight-forward too, no major difference to the hardware appearance, still supports the current Joy-Cons, but likely features a Tegra X2 instead of an X1 for added performance, better battery life, etc. Hopefully performance/battery saving options, as the Switch hacking scene has demonstrated that overclocking is very easy to do and provides tangible performance benefits. The Switch by default is underclocked (even when docked) to reduce heat generation and power consumption. Reveals of new hardware are big things and, obviously, Nintendo is going to do that on their own terms. So I wouldn't expect anything else other than avoiding the answer or denying the rumors. I’m beginning to wonder if they really have anything at all to announce ? Are they waiting for the PS5 and Xbox 2 to come around ? Without docking support, they can get rid of the internal fan and heat sink to shrink it. If the joy-con starts drifting you can't buy a new one to replace it as it's no longer modular. They better make long lasting analog sticks. Also, this thing won't support LABO... it's basically a 2DS. @Retupmocnin But even in handheld mode the Switch needs cooling. Especially on games like BotW, Diablo 3, Titan Quest etc. I doubt that the Tegra chip will survive without heat sink and cooling fan. @Zuljaras Nvidia probably built them a new 10nm Tegra chip that doesn't need cooling and more power efficient so the battery will last a few hrs more. If Nintendo had a better account system I wouldn't mind a personal version of the Switch. But this is Nintendo, so to get your games on it from the console version or vise versa, you probably have to purge all trace of your stuff on one of them, because Nintendo has zero concept of a game system being shared and how that comfortably works. They came closest with Wii U and 3DS, but that was entirely on accident. @Retupmocnin I am no expert but I doubt that there is such a chip that does not need cooling and in the same time can put out graphics like Wolfenstein 2 and DooM 2016 for the same price. Lol, It aint gonna happen. The Switch is fine as it is. We only need a Switch pro around 2022. If people really want to game on a budget and fully portable then buy a 3DS. Seriously! I don't understand the whole hype craze for a Switch Mini. It ain't going to happen! It would completely go against the core concept of the detachable Joy-Cons! Like I said in previous topics about this, what we will likely see this year is Nintendo finally releasing Switch console bundles without the Dock at a price point of around 200 dollars, which would put it on the same price point of the 3DS XL and try to get those handheld gamers to make the jump to the Switch. Since you can already buy the Dock separately, this would make perfect sense to start selling the Switch console without the dock. This way pure handheld gamers can buy just the console without the dock and save money, but also gamers on a tight budget will gain access to the Switch due to a lower price point of entry! Switch mini would make certain Nintendo-licensed games unplayable (hint: SMP), so it's not an option. If it was, it'd still be with detachable joy-con. Why publish a new article and not just update the old one? The topic gets boring because it's the same again and again: rumours! I don't get why people won't just let this go. They've said they have nothing to announce on a Switch remodel multiple times. If one even exists, they'll talk about it when they're ready to. Pestering them repeatedly with the same question won't change that. I would get a Switch Pro any day. Hoping they eventually improve on the model, just not too soon. Also Nintendo should focus on giving bigger cartridge options for developers AT affordable prices! @Zuljaras CPU/GPU in the latest smartphones are faster than Tegra X1, they don't need cooling. Inb4 Nintendo announce a new version and illiterates start saying Nintendo lied about there going to be one. 'Nothing to announce' means Nothing. To. Announce. It's coming. It will release just in time for the holiday's this year for either $200 or $250 with a game. @Retupmocnin But are they cheap enough? I mean the Switch Mini is supposed to be with lower price. @Retupmocnin It would support Labo, you'd just need separate joy cons. @gcunit How are you going to fit the screen into that Piano? Or the Bike? Or the House? The usual. Nintendo has nothing to announce to media, Nintendo has something to announce to unspecified "system suppliers", system suppliers have everything to announce to media because NDAs don't exist and breaking them doesn't cause problems. All to confirm our speculations about a model meant to drop the price by ditching a dock (which the original revision has been doing in Japan for ages) and gluing on the joy-cons (because the rails and bluetooth surely make up most of their component cost). Can't these things just be announced and happen when they do? Talk about a direct hunger when the audiences go from software expectations to HARDWARE ones. Or maybe the point is to wait for late 2020/2021/2022's actual revision and triumphantly link the dusty comment with "TOLD YA!"? Read some cool insights on above comments. Yeah, Nintendo has been known to "we're probably not doing it/WE DID IT" but they have market plans and shareholders to please. They can't go "Oh well, you guys win, you've discovered our master plan, here are all our secrets for your leisure" every time a rumor goes up. So it’s happening. Whatever strange reasons people have for wanting it not to be true, it’s happening. A bunch of us keep point this out. They aren't gonna say anything until they are ready to properly announce it. Anyone who follows tech stuff knows that the moment you officially confirm a new version of a device, sales of the current version drop off. More than one company has shot themselves in the foot making that mistake. Personally, I hope we do get a refined Switch. I'd like to see both a Switch mini aimed as a more budget device, and a Switch pro with a much better battery, 1080p screen, and bigger internal storage. But I am perfectly okay with waiting. I still play my Switch almost every single day. I like that people think the company that split the N64 userbase by making games that needed an Expansion Pack, that released a game halfway through the life of the Wii that needed a new Controller/adaptor for existing Controllers (Wii Sports Resort), that released the New 3DS and gave it exclusive games and VC Content, that released the DSi and 2DS, that bundled the non-internet equipped Wii Mini with Mario Kart Wii, will refuse to put out a Switch Mini with fused Controllers because of 1-2 Switch and Super Mario Party. Would buy a Switch XL but the Switch is already 'Lite' enough as it is! This has "you got us" written all over it. Honestly as silly as it sounds it wouldn't surprise me if the "mini" console is just a regular sized switch without anything else in the box, with Nintendo's excuse being "other people own switches so use their power cable, dock, and joy-con". I swear that was the reason why Nintendo didn't ship the new 3DS with a power cable. Good! And they shouldn't announce anything on that matter. If anything, bring a more advanced Switch (with 100% backward compatibility) and reduce the price for the standard Switch. That would make sense, but who in their right mind, would buy a wastly inferior product? @Retupmocnin Good point. I fall to my knees, humbly corrected. Have you never heard of the 2DS or the Wii Mini? @Sanangelo89 3DS isn't made anymore, and no one new is buying it anymore as the thing has totally tanked in sales, revealed by Nintendo's own quarterly report. Of course there's nothing to announce, because the "Switch Mini" is a stupid concept. The Switch is already small enough, and the whole point of the system is that it's a hybrid console. A "Switch Mini" would be quite literally pointless. Of course they have nothing to announce. If they had something to announce they would announce it (or at least announce the announcement, as is the new norm). So, am I the only one who remembers Nintendo's president saying just a few months ago how they were looking at various options for Switch, taking into consideration current users feedback? If enough people say it's too big to carry with them (god do I hear that a lot from 3DS fanboys), and with 3DS sales now in the toilet, then it's pretty clear they're going to be hearing a lot of how it's got to be smaller. That said, I don't doubt there's an R&D team looking at ways to shrink it, and still adapt it to the dock. Their R&D team every year works on something. With no 2DS revision in 2018, it's pretty clear (especially given the yearly updates in the past are now done) that their R&D is done for the 3DS now, and fully focused on Switch. @Yozora146_ Apple's A12 chip has the same performance as Xbox One, it's using 7nm process. In comparison Tegra X1 is using 20nm, which is really ancient... If Nvidia built a new batch of X1 for Nintendo using 14nm, there will be no need for cooling and may even extend battery life. @Retupmocnin Luckily Nintendo has nVidia exclusivity for many years from the sound of it so expect the next gen Switch to be far more powerful in every way when it releases in like 3 years or so. Isn't "Nothing to announce" Nintendoese for "Ships June 12th"? I'm okay with my current Switch, so I don't need a Switch Mini myself. "Or is it an attempt to shrug off any rumors until the company is ready to reveal its plans.."
Seriously bro did you just ignore what I said, that chip will throttle which will decrease its power output over time usually in about 15minutes why else do you see games consoles and PCs with cooling vents how can you not understand. A quick Google search could teach you more. Also did you even put any thought onto how much that would cost iPhones are like £1000 yeah that's really going to go into a supposedly sub £200 console. Sorry I don't need a new Switch yet but new features for the current Switch would be nice. Why would they announce a "portable" Switch, when it has been available since launch? Since we've forgotten about the original NX rumors, I believe Nintendo will release a "Switch home console" to complete to the two-part system. I'm very surprised this hasn't been brought up, as "screen-less" Switch would be the cheapest option. They wouldn't need to bundle the Joy-cons with it either, it could have a Pro controller option. Doubtful it'll be more powerful the pro versions of the Xbox One or PS4, but you could play your Switch games on TV without using the dock. Your data would be syncing via USB-C and shared between the two systems. It would be optional hardware. When they release an upgraded "Pro" portable, then I can the see the current one being dropped down as the entry model in that line. Much like Apple does with the iPads. If it's smaller and focused on handheld use it's not really a "Switch" anymore so they should call it the Nintendo Portal. Because of the portability, not because it's games are 80% old ports. The idea of a mini Switch without Joycon or a dock seems a bit silly to me. The whole concept, and name, of the Switch is built around console to portable play. It's kind of like making a portable, portable. So that means we can expect an announcement next week? Please NO downgraded mini budget version. Would much rather have an upgrade like a Switch Pro. I won't have any reason to buy an iteration that has less than the one I currently own. If it's real I don't think it would be announced until April. The mini would be a asine decision and would hurt rather then help the Current Switch. Now if they made a Pro Switch that would be different but as of now they aren't going to commit nor say something that would hurt themselves in return and everyone needs to get their heads out where the Sun doesn't shine and wait. I read this as something is definitely in the works, but they aren't ready to publicly acknowledge it. If they said "We are not considering a console revision at this time," then I would say they aren't planning anything atm, maybe news in 2020 or 2021. Whatever is in the future, it doesn't bother me. I don't want a handheld only Switch nor a Switch Pro. Switch Pro and Switch Go! "We have nothing to announce" isn't an indication that they aren't planning anything. I'm sure some of the 70+ comments above have hit on this already (haven't read them yet), but Nintendo isn't about to shoot themselves in the foot about a new SKU confirmation until they feel it's the right time. We know it'll happen at some point, the question is...when? I'd personally like to see a type of Switch Pro option, but I think a Switch Lite or Switch Mini option makes more sense right now. The 3DS is on its way out (much as that fact saddens me), so Nintendo will be looking to capitalize on that block of customers (specifically parents who want cheap entertainment options for their kids as well as people on a lower or tight gaming budget) that they'll slowly be losing. FWIW, I'd think that if there were a Switch Mini that looked like that, they'd just go ahead and include a proper d-pad instead of buttons. After all, the only reason for the directional buttons is for the sake of being able to use them as actual buttons when detached and turned on its side. As for Nintendo's comment: There's nothing to glean from it whatsoever, as always. A dockless version makes sense, as it appeals to households who already have a Switch and dock, (and if needed, a dock can be purchased separately), and it requires no additional costs in R&D, tooling, or new manufacturing lines. Every other rumour is garbage, with attached joycons the dumbest of them all - you’d lose motion-control and portable multi-player, which are two major selling points of the Switch. Well, If they wanna make it smaller and affordable and make it work they should not dessign it like that. It would be way smarter if they made it a clamshell dessign. Then they cout use regular removable joycons on the lower part. and the middle part that you attach the joycons to wound aslo function as a stand and possibly also a dock if the was an HDMI port as well as charging port there. This way it would be way more compact and also more robust. Seems like a great upgrade for kids who want a newer and better 3DS replacement. @electrolite77 And because a smaller factor will mean less performance/battery life and will make games like DOOM and Wolfenstein and others virtually unplayable. We’re not talking about 1-2 Switch and Mario Party only. The issue is that with the current chip, there’s absolutely no way you could reduce size and keep performance. Now, if they have a different chip we don’t know about that solves those problems... that would be different. @maruse smaller screen could run lower resolution for the same ppi... That alone would allow underclocking and this running a smaller battery and smaller cooling solution for the same game performance and run time even without a die shrink. I have a question? Is Xbox Live coming to Nintendo Switch? The mistake Nintendo made with the Wii, was to wait years before upgrading the console. Which by the time it did, the Wii U was obsolete. If the Wii U came out 2-3 years after Wii released, despite record sales, I think they both would have sold even better. There were rumors or a touchscreen controller before it was called the Wii, amd even a couple years ibrovwii lifecycle, rumors of an hd version that we never saw...until the Wii U. Which I’ve always said meant “ u=upgrade.” Switch could maintain both sales and more 3rd party support if after 2-3 years, and sales start to lose momentum, switch 2.0 releases. They been doing this with portables and look at how well the doomed 3ds sold after a slow launch. @NEStalgia Maybe, but a new resolution means a new optimization point for developers to work. Changing resolutions is not just something that can be done without much thought. Console games, aren't made with scalability in mind (that's just a PC thing), they target predetermined resolutions from the start. I'm not a developer so I don't know just how hard that could be, but anyway, is something to think about. @maruse console games are as available as pc games. Theyre pc engines, and this is a tegra x1.... Mobile is inherently scalable as well, as many phones and tablets come in different resolutions and change resolutions for battery saving, etc. Granted, i think a smaller screen would be problematic to see a lot of uis on, so i wouldn't buy one probably, but especially in Japan, there would be strong demand for a shrink i would think. @Donutman please, please tell me you're meming. Of even nl regulars legit think wiiu was an upgraded wii rather than a new platform, the wiiu marketing years were even bleaker than i thought. Either way, mini would be the 2ds of the switch world (cheap, kid friendly, for Pokemon) rather than intended as an upgrade. "New switch xl" happens later. @Retupmocnin Actually, it would support labo just fine. Just get a seperate set of joy-cons. Nobody said you couldn't pair extra joy-cons or a pro controller to it. @Yozora146_ Do you know how chips got faster every year? They moved from 20nm to 14nm to 10nm and now reaching 7nm. It's nanotechnology, they are shrinking the silicon so it won't overheat. This way they can increase the clock speed and make the chip faster. Current Tegra X1 is using 20nm process, if Nvidia moved it to 14nm while retaining current clock speed: there won't be any need to cool the chip and it won't throttle. When they shrink the chip they usually did it so they can increase the clock speed, but if you don't increase the speed: no fan is needed. @CreepyNoodles Try fitting the screen into the LABO Piano, House or Bike. Nintendo will never put out a model called 'Pro'. That's just not Nintendo. I'll eat my socks if they ever do. Just saying 'cos everyone's like 'yeah we need a Switch Pro not a mini'. I for one would love a mini – so long as it's dock-able. This Switch is a frickin' heavy portable guys – and some of you want it bigger?! What the heck. Are you the same guys that are happy taking photo's with a 12.9 inch iPad? Yeah I know that but a smaller process doesnt wipeout thermal limits even a hypothetical 1nm will still throttle eventually and basically all you've said is that a better nm means less heat cuz the chip could be underclocked (the switch already is btw) by keeping the original clock speed giving enough overhead so that it would apparently not get too hot, however neither you or me know the thermal limit of running a better chip at those clock rates the heat might be still to much if anything it would be more likely to end up with a smaller fan. And lastly it doesnt change the extra cost of a new chip anyway, therefore this whole thing is pointless the goal of a "switch mini" is cheaper not more expensive. It’s clearly coming, I found their statement hilarious. I might buy one, but only if I can use it in addition to my current Switch. That means that I can have all my games on both Switches, and can simply play whichever one I want. If they do it like 3DS (which I still love and play all the time) where the games are locked to one system, I will not buy the Switch mini. Apple lets people play the same games on iPhone and iPad, etc. so Nintendo needs to let people who own multiple versions of their consoles play games on all the systems they own. Anyway, something is clearly coming from Nintendo. It will be fun to see what they create this time around. They would be fools to let the 3DS die and not have a product to fill that market. Sounds like rumour mill are farming at alarming rate sometime here we need to cut the legs from running wild. They announce when they announce as we have far to many so called "Insiders" talking and not enough realistic of what can and can't be done. @nintendosage, thats not my problem. I know the 3ds sales is much lower now but people should quit asking for a Switch mini. it totally defeats the purpose of what a Switch is. I won't be interested if it comes out. My standard Switch is perfectly fun and capable as it is. It's happening. Nintendo wants to replace the 3DS with the Switch Mini, but doesn't want to hurt Switch sales right now. Not the way I see it. I think they’ll make slight size reductions from having fixed Controllers and the main selling point will be durability. Like 2DS again. But as said elsewhere it’s equally likely a smaller screen could run at a lower point allowing them to reduce processing required and therefore battery life. It’s Nintendos problem and they will want to fix it. They don’t design everything around what you think they want you know. @electrolite77, Lol, at the end of the day i already have what i want. And it really aint a problem its just people asking for more then they should get. Even if a Switch mini will come then people will still complain that certain games can't be played or might have more power or performance issues or that they want a smaller device so that they can still connect to the TV etc. So no, i hope they dont released a Switch mini but rather invest in a Switch pro or 2.0 that can be release in a few years from now. If people want a handheld, play a 3DS, try to find a Vita or even better, play on your flipping phone.